LIVE VIDEO: Protesters Gather For DC Nazi Rally - Joe.My.God. Anti-racists protesters and activists continued to make their way to downtown Washington early Sunday afternoon to counter a white supremacist rally scheduled to begin at 5:30. As many as 400 people are expected to make their way to Lafayette Park across the street from the White House later to take part in the event planned by the organizer of last year’s deadly white supremacist rally in Charlottesville. 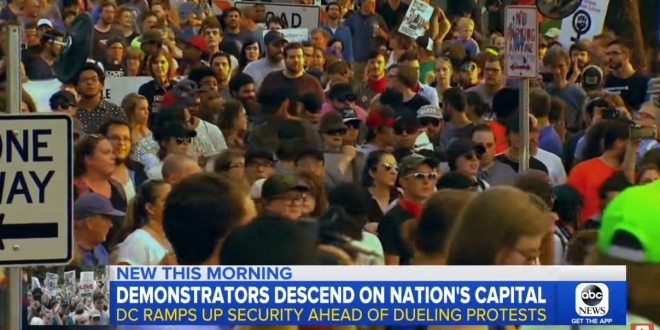 In Washington, thousands protesting the white supremacist rally also are expected at numerous locations, and many plan to converge on Lafayette Park, before the organizer of the rally, Jason Kessler, and his followers arrive. Both Kessler and opposition groups have permits from the National Park Service to demonstrate at the park, a leafy seven-acre enclave just across Pennsylvania Avenue from the president’s residence. By 12:30, close to a thousand protesters had arrived at Freedom Plaza, a few blocks away from Lafayette Park for an afternoon rally of speeches and music. D.C. police could be seen early Sunday walking the streets near the park as officials began shutting down several downtown streets where protesters are expected to gather.